Home / science / Have NASA scientists discovered GOD 17,000 light years away? A TERRIFYING image captured by specialist NASA telescopes aimed at a galaxy 17,000 light years away has sparked online speculation the Creator of Universe has been caught on film. The space agency’s Nuclear Spectroscopic Telescope Array - or NuSTAR – was aimed at a pulsar (or neutron star) called PSR B1509-58 a staggering distance from earth. What they were sent back was a spectral vision of an outstretched hand – which has become known as the Hand of God. The ‘hand’ is believed to be the remnants of the star which went supernova and ejected an enormous cloud of material – leaving pulsar PSR B1509-58 in its wake. The remnant cloud when viewed via high-energy X-rays shows up as a green, red and blue hand, a staggering 175 light years across. California Institute of Technology in Pasadena, said: "NuSTAR's unique viewpoint, in seeing the highest-energy X-rays, is showing us well-studied objects and regions in a whole new light. 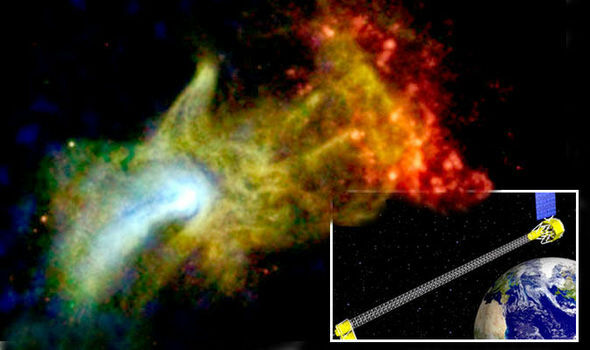 “The new image depicts a pulsar wind nebula, produced by the dense remnant of a star that exploded in a supernova. particles into material ejected during the star's death throes. The pulsar is located near the bright white spot in the image but cannot be seen itself, NASA officials said. Hongjun An, of McGill University in Montreal, said: "We don't know if the hand shape is an optical illusion. 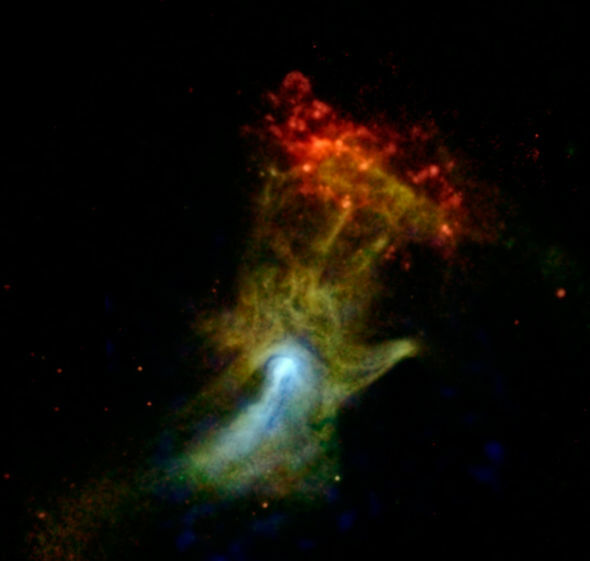 "With NuSTAR, the hand looks more like a fist, which is giving us some clues." The red cloud appearing at the fingertips is a separate structure called RCW 89. Some believers on religious websites are not so scientifically prosaic in their view.